The OMR answer sheet checker not just checks and evaluates the OMR answer sheets but also generates reports. This makes it easy for organizations and institutes to declare the results. There are several result layouts and formats to choose from. 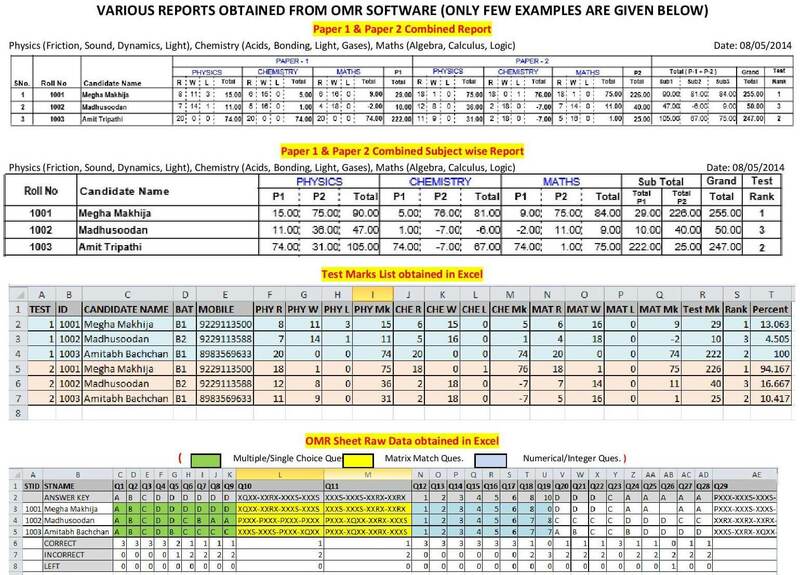 From simple to detailed graphical reports, the OMR software is perfect for displaying any type of report card. Some of the report formats include PDF, Excel, Printable, CSV, DBF, Access, XML, etc. Even if you do not want to use the layout or format available, you can transfer the data into Excel format and make the changes as per your requirements. Even if you need only the basic information from the OMR software, but want to make the report in your own system, you can still use the OMR software. The data derived by the software would be transferred into Excel, SQL or Access format. Along with this, you would also receive a detailed explanatory map of the field structure. This makes it easy for you to import the data into third party software and use as needed. 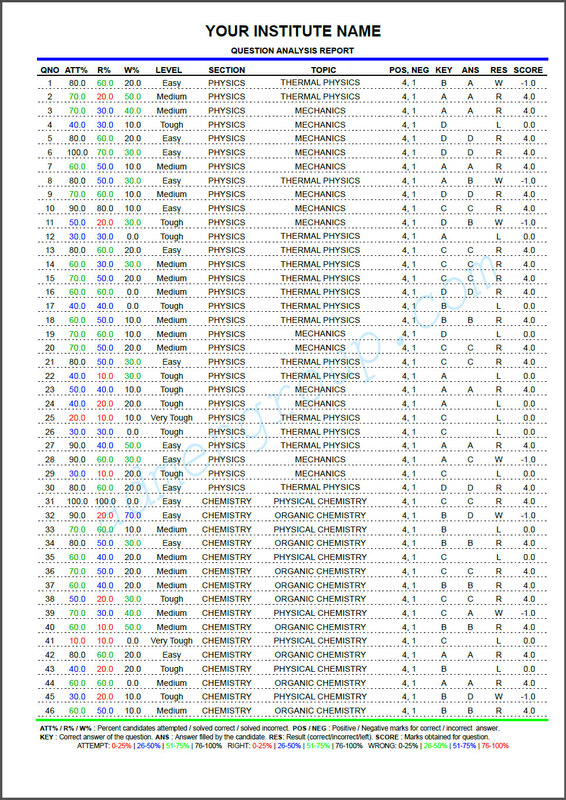 Here is the list of data that can be exported to Access, Excel, SQL, CSV, etc. after OMR sheet evaluation. Please note that we do not provide data in API/DLL or SDK formats. The OMR software reports can be easily uploaded online on your website. It is a convenient way of declaring the test results. 11. Question paper analysis report based on several statistical parameters including Item Response Curve (IRC), Discrimination Index, etc. Question paper analysis report based on several statistical parameters including Item Response Curve (IRC), Discrimination Index, etc. One of the various types of reports is the question analysis report which gives detailed analysis of the answer sheet. This analysis report displays the detailed response statistics of every question asked in the test. All this is explained in the video. Here you can view a video about the graphical report generated by the software. This report provides graphical details of every candidate's performance. Each candidate receives multiple pages of reports of his/her performance. These reports display the growth and performance of every individual. Take a look at the video which shows how the software exports the data received by the test checking software into output files like Excel. It is possible to use the data either by editing it in Excel or by integrating it into third party software. With all these features and options available, it becomes very easy to upload OMR software reports on your website for declaring the results.